Dr. Talwar received his medical training at the All India Institute of Medical Sciences, Delhi, India. He had further post graduate training in the United Kingdom and participated in a research fellowship at Northwell Health before his graduate medical education. Dr. Talwar completed his residency training at Jamaica and Winthrop University Hospitals. He went on to complete his fellowship in Pulmonary Medicine in 1998 at Winthrop university Hospital. Dr. Talwar joined as an attending physician at North University soon thereafter. At North shore University Hospital, Dr. Talwar began his research interests in the field of pulmonary hypertension and interstitial lung disease. 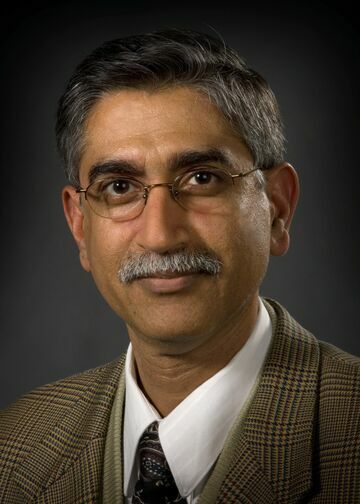 Dr. Talwar is the author or co-author of over 90 peer-reviewed publications and 10 book chapters. He has presented his important research at numerous nation and international conferences. Dr. Talwar’s career over the years has included basic and clinical science research, front line academic practice, and directorship of an advanced lung disease program. This array of experience prepared him to appreciate and respect many facets of medical, organizational, and public policy issues in health care. Dr. Talwar is a clinician who likes to take care of patients using his research and clinical knowledge. His specialty is advanced lung disease, patients with interstitial lung disease and pulmonary arterial hypertension who needs specialized care. This specialized, targeted care is provided in the advanced lung disease program that he has been directing for the last 13 years. Dr. Talwar views himself as a clinical scientist. His work is on translational research in pulmonary medicine with a focus on pulmonary hypertension and advanced lung disease. He is an Associate Investigator with a clinical track for the Center for Heart & Lung Research at the The Feinstein Institutes for Medical Research. Dr. Talwar has been the recipient of ECRIP award thrice. At present, he is also co-investigator on a National Institutes of Health study entitled MIF-Thyroxine Interactions in the Pathogenesis of Pulmonary Arterial Hypertension. Dr. Talwar’s research also focuses on the various comorbidities that affect patients with pulmonary hypertension and interstitial lung disease. He and his team take a close look at patients’ mental health as well as their health related quality of life. His role in the division of pulmonary, critical care and sleep medicine is also that of an educator. Dr. Talwar has been involved with teaching residents and fellows since he began his career at Northwell Health. He has also taken an active role in the teaching of the summer research students and numerous volunteers. Palkar AV, Agrawal A, Talwar A. “Orthodeoxia: A Review.” 2016 May. Publication Status: Under Preparation.